reflected on the river-life metaphor as I drove down the driveway and parked. 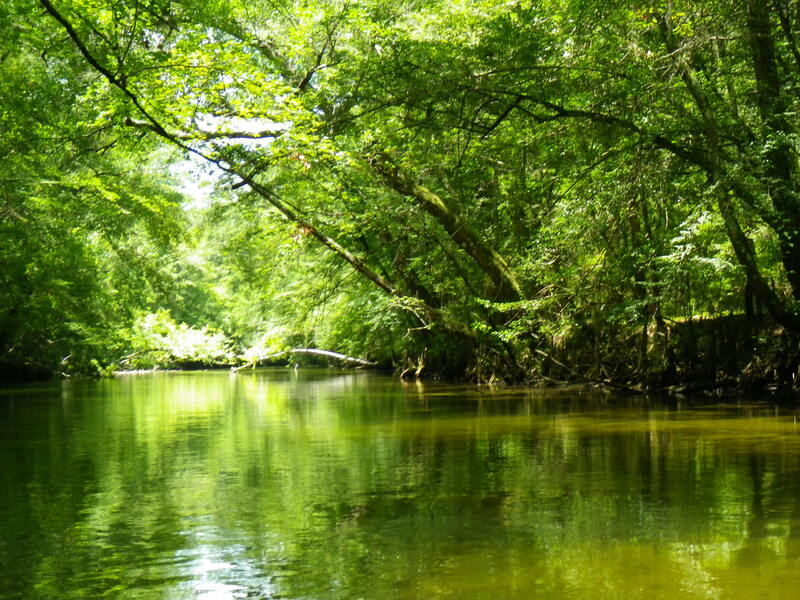 I chose Econfina Creek as my second river to paddle in the Panhandle. Huff describes the scenery as “superb,” with giant cypress that arch overhead. Carter et al. claims that many consider the Econfina the “most beautiful and challenging stream in Florida.” It sounded like a waterway I needed to paddle. So, I selected my kayak from a generous inventory at the outfitter, and I put in right there at 10:30 a.m.—to be picked up at the end of my seven-mile trip at CR 388. Although the water level seemed low, I paddled away on a strong steady current, through the twists and turns of the Econfina. Econfina comes from a Muskogean Indian word meaning “natural bridge.” (Carter et al.) 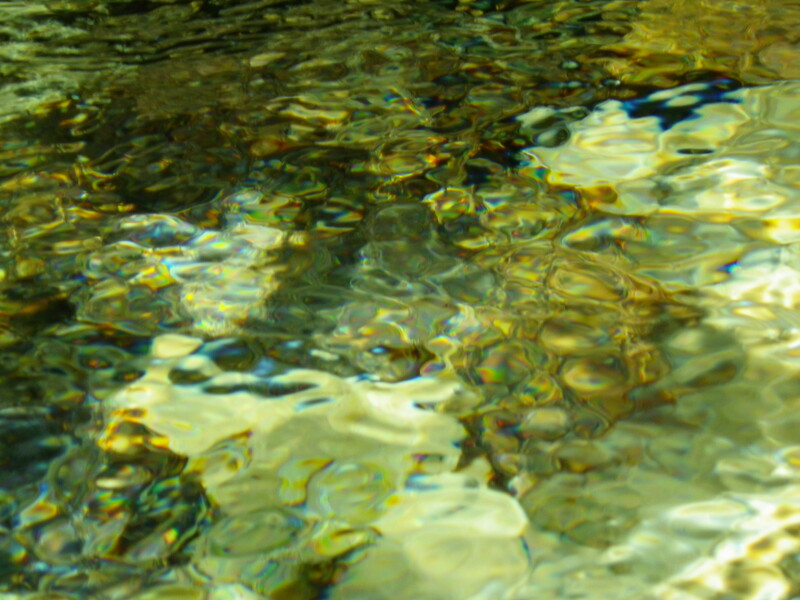 The Econfina Creek originates in the southwest corner of Jackson County, Florida, where a number of creeks add to the flow. Along the way, springs and runoff contribute even more until it finally discharges in Deer Pointe Lake in Bay County. (Boning). The upper portions of the creek run swiftly through limestone and high bluffs with a 7.9 gradient. A gradient 4 and lower banks on the lower portion where I paddled make for easier navigation. Huff’s description of the creek held true; tall, arching cypress, along with magnolia, several varieties of oaks (including Shumard oak and laurel oak) and pines, dogwood, and red maple embraced the waterway. Similar to the Chipola River, the landscape varied with swampy wetlands on one side and high limestone banks/cliffs—these, dripping with lush ferns—on the other. Lots of sandbars along the way made for an easy dip to cool off or pause for a snack. Some of the land around the creek is privately owned; however, the few houses that appeared seemed to blend in with the surroundings. The Northwest Florida Water Management District has acquired about 14 miles along the creek and has built viewing structures so people can access the springs. I paddled past several of these springs along the way. At Pitt Spring, I met two local women, Gail and Rose, who came to cool off on a hot day. During our chat, they described the beauty of the creek when the dogwoods and azaleas bloom. At Emerald Spring (the main source for Econfina Spring water), a young family snorkeled at the base of the 25-foot limestone bank to view the spring’s powerful flow. What a great place to be on a slow, lazy day! I hung my legs over the side of my vessel, dipped my feet in the clear, cool water and let the flow take me beneath the canopy, around the twists and turns of the river, returning to reality only momentarily to maneuver around a deadfall or a sharp corner. I love vacation!